After paying their debt to society, millions are still branded by their felony records. The Inlander is committed to exposing miscarriages of justice. Send tips and story ideas here or call the news tip line at (509) 325-0634 ext. 264. Some people’s lives change forever in a single moment, and for Carol, it happened 22 years ago. Before she tells her story, she prints a “do not disturb” sign and tapes it to her office door. Her past life still isn’t one she likes many people to know about. At age 26, Carol was dying. Years of booze and drugs had turned her skin gray. Her bones stuck out from her thin frame. Friend after friend died around her. And then it happened: She got arrested. A cop pulled her over and found cocaine and a gun in her car. Carol spent the next 30 days in a county jail, sick with drug withdrawal. She ended up in court-ordered rehab in Spokane, and there she began putting her life back together. She wanted to be a better mother. She wanted to go to school. Start a career. Maybe even start her own business. She studied to be an insurance agent. But when it came time to be certified, Carol’s old arrest popped up. So Carol decided to go into nursing, and before she started, she told Spokane Community College that she had a criminal record. Then she found out that — again — she wouldn’t be able to get a license. A felon can’t be a nurse. Carol may have left her past behind, but it kept coming back to haunt her. It was as if she had been marked with a scarlet letter. Like society had decided that she could not be anything but a felon. Her story is hardly unique. From 1970 to 2000, the United States’ rate of incarceration jumped by more than 500 percent. Today 2.3 million people live behind bars, and an estimated 13 million Americans have felony convictions on their records. While half are violent offenders, half are like Carol — people with drug offenses or property crimes. And long after their sentences are served, debts paid, rehabilitation completed and lessons learned, they’re still branded as felons. Felons are, perhaps, the last group that can be legally discriminated against: A felony can automatically disqualify someone from a job, from getting a safe place to live, from being eligible to vote. Many felons end up living in poor neighborhoods and raising children in crime-riddled areas — where their children get caught up in the same traps. Elliott Bronstein, who works with the City of Seattle Office for Civil Rights, says reformed felons like Carol who regret their crimes and want to change can’t. And that’s something everyone should care about, if for no other reason than money: Housing a person in prison for a year costs more than $25,000. Todd Clear, one of the nation’s most prominent scholars of criminology, says it is impossible for someone like Carol to get a fresh start. The system is not only set up to make felons fail, but to keep them coming back to prison. But some people, like Carol, never go back to jail. That month behind bars was enough for her. Yet more than 20 years later, she still lives with the shame of her crime. She feels like a lesser citizen: someone who broke the law. Even today — employed, a homeowner, a grandmother, a college graduate with her criminal record expunged — she worries that her felony will yank the bottom out from under her. For that reason, she asked The Inlander to not publish her last name. She fears she could lose her job. “How long does a person get to pay for their sin?” she says. “I have paid a desperate price for my sins, and so have my children. Since the early 1970s, the number of people behind bars in the United States has exploded. In 2008, one in every 134 Americans went to prison or jail — a rate higher than any other country in the world. Aside from the millions incarcerated, another 5 million people are on probation or parole. Minorities — particularly African Americans — are even more likely to see the inside of a cell in their lives. Nationally, for every one white person in prison, there are 5.6 blacks. And Washington state’s ratio is even higher: 6.4 blacks for every white person. Incarceration rates are much higher for minority populations — and particularly for African-Americans. Nationally, for every one white person in prison, there are 5.6 African-Americans. In Washington, that ratio is higher: 6.4 blacks for every white. Nationwide, though, Iowa has the worst imbalance: 13.6 to one. The inflated prison population is a direct result of tough-on-crime laws, mandatory sentencing and the War on Drugs. Especially since the 1980s, we have shuttled more and more people into the system. “What’s happened in the last few decades are two overlapping trends that have made these issues much more significant: tremendous expansion of the prison system and the number of people with felony convictions,” says Marc Mauer, executive director of the Sentencing Project, a D.C.-based nonprofit that advocates for criminal justice reform. The belief that throwing more people in jail will reduce crime is false, Mauer says. In fact, between 1991 and 1998, the states that put fewer people in jail than the national average experienced a greater decline in crime rates than other states. The employment restrictions facing felons upon release are complicated and vary from state to state. In Washington state, anyone with a felony drug conviction must wait five years before working with children or with anyone who has a developmental disability. Theft crimes will prevent someone from working with anyone vulnerable, such as people in a nursing home. Felons cannot work in insurance, hold a position in a labor union, provide health care services for anyone receiving Medicare or work as a pharmacist. In some states, a felony might even prevent someone from becoming a licensed barber. And a drug conviction automatically disqualifies someone from getting government student loans. In Idaho, a woman convicted of a drug offense may be denied welfare benefits for life. Clear says the multitude of rules and regulations that ex-felons must comply with are also a major reason that American prisons are so overcrowded. It’s not because there’s a glut of offenders — it’s because penalties are harsher and sentences are longer. Indeed, Clear’s studies show that it isn’t new crimes that usually land someone back in jail — it’s a parole or probation violation. And felons living in poverty — ones without a support system or the cash for a good lawyer — are hit the hardest. For years, Carol strung together enough money from odd jobs to support her four children. She bagged groceries at Safeway. When that wasn’t enough, she took a second job as a cook at Dolly’s Cafe (a restaurant she would later own). After her husband died in 1995, she raised her children alone. She feared that they would make the same mistakes that she did. 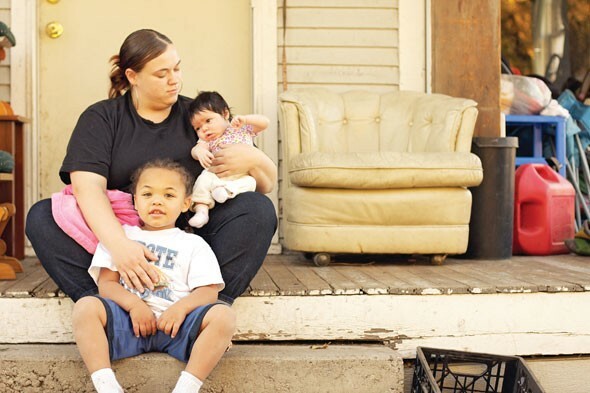 Carol’s daughter, Carrie Collette, sits with her son, Dion, and daughter Eillie in front of their east Spokane home. It will be bulldozed next year to make way for the North-South Freeway, and Collette fears she won’t find a safe place for her family because of her own felony record. The cycle that Carol’s family was caught in — of crime and poverty — is one that has been studied at length. Clear has written several books about the cyclical nature of crime and poverty, including Imprisoning Communities, which examines the relationship between incarceration and the deterioration of communities and family life. “By making it such a lifelong debilitating experience, we have sentenced all the children, too,” Clear says. “You produce this cycle of disadvantage. And right in the center of it is imprisonment. “People who say, ‘Don’t do the crime if you don’t want to do the time … are also saying, ‘Don’t be a child born to [a felon],’” he says. Carrie Collette is now 23 and wonders constantly if her family’s history will be passed onto her son and infant daughter. Because, today, Collette says, she’s staring down all the same guns that her mother once did. She can’t find a safe place to live. She can’t get a job. No matter how much she tells employers and landlords about her past — about the crime she committed at 14 and the sentence she served — she can’t seem to get a break. Collette felt neglected as child when her own mom was struggling to get by. At 14, she was involved with a bad crowd. She craved attention. She tried Ecstasy. And she robbed a hotel. “My friend said something about ‘I used to work at this hotel and it’d be really easy to go take the money,’” she says. “One thing led to another, and the next thing you know I’m trying to prove myself. I showed them the little handle of my plastic gun and said to give me the money. When she was caught, Collette was sent to Spokane Juvenile Detention Center for several months and later to a group home in Benton County. Because it was her first offense, Collette took a deal to get out early, agreeing to have her felony on her record until she was 28. She soon learned otherwise. Collette is studying to become a nurse (just as her mother once did). She knows she can’t get a nursing license as a felon, so she’s hoping to stretch her time in school out past her 28th birthday, when she hopes to expunge her record. But school is the least of her worries today. She’s more concerned about where she will live in less than a year. Her house — which is owned by her mother — will be bulldozed next summer to make way for the North-South Freeway. And already the burden of finding a safe place to live is weighing on her. “I’m still going to have to move into a place that’s dangerous for my children,” Collette says. “I should be able to run a home that’s safe for my children. My children now have to grow up around the same things that influenced me to become a felon. Unconia Al-Hajri hates her house. She doesn’t want to raise her son here. The screen on the front door is falling off the frame. There’s no doorknob on the back door. Her bathroom sink hangs off the wall, so she uses the bathtub to brush her teeth. There’s a hole in the side of her house where anyone can climb through. For now, it’s covered with a piece of wood. But what makes her hate it even more is the drug house around the corner. Smoking a cigarette on her front porch, she watches as three men on bikes ride away from the house. Neighbors across the street pause to watch them. Everyone knows what they’re doing in that house. Al-Hajri knows what they’re doing because she used to be one of them. Unconia Al-Hajri holds the letters that prove she doesn’t have a felony. Yet she keeps running up against a charge that she worked a year to get dropped. At 18, she was three years into a full-blown addiction to methamphetamine. Her story of addiction is like so many others. She lost her friends. She lost her family. She lied. She didn’t care about anything but getting more drugs. Those years are a blur now. She can barely remember the people whose couches she slept on or who sold her drugs. She can’t even remember the name of the guy who was in the car with her the night she was arrested. That night, she was at a house being watched by police. She pulled out of the driveway onto Wellesley. Windows down, music blaring. She and that guy weren’t going anywhere in particular. They were just out for a ride. On top of driving without a license and driving under the influence, Al-Hajri was also arrested for possession of a gram of methamphetamine and a joint of marijuana. She spent the next 72 hours in the Spokane County Jail. And she was terrified. But she got lucky. Instead of staying in jail, she was offered a deal: Because she was a first-time offender, she could go to Spokane County’s Drug Court for an intensive, 12-month-long program. If she completed it, she would walk away without the drug conviction on her record. She would not be a felon. If getting arrested wasn’t enough to scare her, before she entered the program, she got another wake-up call: She was pregnant. Al-Hajri knew that she didn’t want her child to end up like the kids she had seen living in drug houses when she was an addict. So she committed to completing the drug program. It wouldn’t be easy. Every day, Al-Hajri had to call in and find out if it was her day to take a urine test. If her number came up, she had to catch the bus and get to the testing facility on time. If she was a minute late, the doors would lock. And a no-show for a test was considered the same as it being positive for drugs. “I’d be two minutes late and they’d stand in front of the door and lock it and say, ‘You’re not getting in,’” she says. She says she was on bed rest for her pregnancy but still had to go in and serve her time at Drug Court. Her house was inspected for drugs and alcohol. She completed community service. She sat in support groups. After 12 months, she graduated. Over the past 15 years, only about 32 people a year have done the same. Al-Hajri’s situation is unique because she hasn’t actually been convicted of a felony. But the charge — the fact that she was pulled over with drugs — is on her record. And it will stay there unless she gets it expunged, which is a lengthy and expensive process. In the meantime, if someone background-checks Al-Hajri — for a house or a job — her meth charge comes up. So despite her hard work getting through the drug program, that charge has prevented her from living anywhere but here, next to the drug house. It’s the best place that Al-Hajri, now 25, can find for her and her young son. She’s applied for six new places to live in the last month. Landlords at some of the worst housing complexes have hung up on her when she tells them of her meth charge. And that’s the thing that infuriates her: Her year of Drug Court ensured that she wasn’t a felon — but she’s being treated like one. Washington is late to join the progressive voting rights game. But in the last year, the Evergreen State at least jumped off the bench — even if only just a little. Last June, Gov. Gregoire signed a bill making it possible for people like Jerry Sumner and Carrie Collette — folks with thousands of dollars in legal financial obligations — to regain their right to vote. As it stands, almost 4 percent of Washingtonians can’t vote, including 17.2 percent of blacks. That’s because they’re either in prison, on probation or parole. It could be worse: Porter points to Kentucky and Virginia, where felons are banned from casting a ballot for life. But it could be better, too. In Maine and Vermont, felons can vote from behind bars. Porter calls Idaho “very restrictive” — but the only thing differentiating Idaho from Washington is last year’s bill. Voting rights for felons in Washington made national headlines again this month when the Gonzaga Law School-bred case Farrakhan v. Gregoire reached the Ninth Circuit Court of Appeals (read our story from January 2010 here). Attorneys argued that because Washington’s criminal justice system tends to be racially biased, barring felons — who are disproportionately minorities — from voting is a violation of the Voting Rights Act, which prohibits racial discrimination in voting. However, the court affirmed Washington’s felony voting ban earlier this month. Breean Beggs, a private attorney in Spokane, says the way records are kept and readily accessible on the Internet are major issues for felons — and even for non-felons like Al-Hajri. “The problem has been magnified exponentially by technology,” he says. “There hasn’t been a comprehensive reform. Today, Al-Hajri has no driver’s license. Her boyfriend picks her up from school and drives her to drop off applications for new places to live. She goes to school full-time at Spokane Community College. She’s studying criminal justice — and she’s devoted to becoming a probation officer. She wants to help kids who are just like she was. “Maybe I can help them from going this way because I’ve seen a lot and I’ve lost a lot,” she says. But she says she needs to be given a chance first. And that starts with being able to raise her son in a safe environment. Her phone was turned off last week — she didn’t have the money to pay the bill after paying more than $200 for housing application fees. She pulled her son out of daycare after he came home with bruises all over his body. And she recently was fired from her grocery job after a dispute with her boss. The union she belongs to wants her to fight it — but Al-Hajri says she doesn’t have the energy. Jerry Sumner has the same routine every morning. He wakes up early, gets a cup of coffee and sits with the newspaper. He scans the classified ads for a job — any job that he can do without a driver’s license. After a day of chores on the farm — feeding his baby cow by hand with a bottle, mending the fence where the baby piglets have gotten out — Sumner is covered in a thin layer of dust. He finds relief in work: chopping wood, maintaining the farm. The father of three is a quiet man, but he’s vocal about how his felony record has determined the course of his entire life. At 17, Sumner made a mistake. Today, 19 years later, he even has a hard time calling it a mistake. One night he hopped in a car, just to ride around with some friends — like any high school kid does. But he found out when they reached the Zip Trip in Hillyard that the car he was sitting in was, in fact, stolen. And Sumner, a Ferris High School football player, became a felon when he got inside. Today, nearly 20 years later, he still maintains that he had no idea that the car was stolen. Regardless, he spent a few weeks in Twin Rivers Correctional Facility for taking a motor vehicle without the owner’s permission. And from the day he went to jail in 1991, the Legal Financial Obligations (known as LFOs) that he owed started compounding at an annual interest rate of 12 percent. He now owes the state over $20,000. He’s never been able to catch up on his fines, he says. And they grew and grew until they were finally sent to collections. Sumner’s LFOs have swelled each of the 47 times he has been pulled over for driving without a license. Sumner says that he drove all those times because he had to: He had to get to work, buy groceries, take his children to school. He’s also been ticketed for riding a snowmobile and for using a riding lawnmower to mow his fence line. Suellen Pritchard says that she sees people like Sumner come into the Center for Justice offices in downtown Spokane everyday. She says one of the biggest problems facing reformed felons is getting a driver’s license. She bets that about 75 percent of people coming out of the system don’t have a license — either because they never had one, or it was suspended due to unpaid fines or traffic offenses. But a driver’s license, she says, is often the key to solving a lot of problems for a rehabilitated felon. “These same parents have to go to work to buy the diapers and the food, so they drive, they get pulled over,” Pritchard says. “Sometimes they get their car impounded, sometimes they’re arrested. They go to jail. They lose their job. They lose their car. They can’t pay their rent that month so they get evicted and it leads to homelessness. And they have to start all over again. For years, Sumner and his family lived in a shack in Deer Park with no electricity, no heat and no water. He moved his family out to a slice of land in Nine Mile Falls so they could at least have a small farm. And electricity. The farm doesn’t make much money, though. Sumner buys calves when they are young and feeds them until they get big — then he sells them again. He’ll buy hay and pick up all the discarded produce from Second Harvest Food Bank (where Sumner occasionally volunteers) to use as feed. Watching as her husband dumps a sack of potatoes in the cow pasture, Angee Sumner says living out here on the farm isn’t her ideal life. But it’s the only thing that makes her husband happy. Jerry Sumner’s small farm in Nine Mile Falls yields a little bit of cash for his family. But it’s not enough. “It’s my whole livelihood revolving around getting my driver’s license,” he says. “It’s his sanctuary,” she says. “To see him go back to work would make him feel a whole lot better and be a better person — just to be able to do the things that men can do. With his $20,000 in LFOs in collections, it’s likely that Sumner will never pay them off. In some places, outstanding court fees — like Sumner’s — would be enough to keep throwing someone in jail. That was true in Spokane County until earlier this year. The ACLU’s report tells the story of James Nason, a Spokane man who spent 30 days in jail in 1999 for second-degree burglary and was assessed $750 in LFOs. Over the next few years, Nason made sporadic payments. But it wasn’t enough. In 2006, he was arrested under the county’s “auto-jail” policy — which hauled defendants back to jail if they weren’t paying. At that point, Nason’s debt had more than doubled because of interest tacked on over time. Nason’s case went to the Washington State Supreme Court and in June of this year, Nason won. The auto-jail policy violated Nason’s right to due process, the court held, by requiring him to return to jail without first assessing his ability to pay. Prosecutors argued that Nason — then unemployed and living in his car — could have at least tried to pay his debts by collecting aluminum cans. The ACLU argues that LFOs — like Jerry Sumner’s — are perhaps one of the biggest barriers for someone coming out of the corrections system. By 2004, the median LFO assessed for a felon in Washington state was $2,540. If they were able to make a minimum payment of $25 every month, they would be paying for at least 30 years. And if, like Sumner, they can’t get a job — the debt still keeps growing. Sumner says he’s a good man and he’s tried to live an honest life. He doesn’t deserve the pains he’s had for a mistake he made when he was a kid. Angee says her husband is constantly guessing why he has been held down so much for his mistake. Jack Lilienthal is not alone in thinking that it is in everyone’s best interest to help reformed felons succeed. Lilienthal works for Goodwill Industries — an organization that tries to catch as many felons as it can right after they leave the system. Goodwill can help train them to find a job, help them write a résumé, even aid them in finding housing. Lilienthal emphasizes that the felons they see at Goodwill aren’t mass murderers or child molesters. They are people who learned from their mistakes. They just want to move past them. Goodwill wants legislators to spend more time figuring out how to invest in felons than in how to lock up more of them. And Marc Mauer, from the Sentencing Project, agrees. 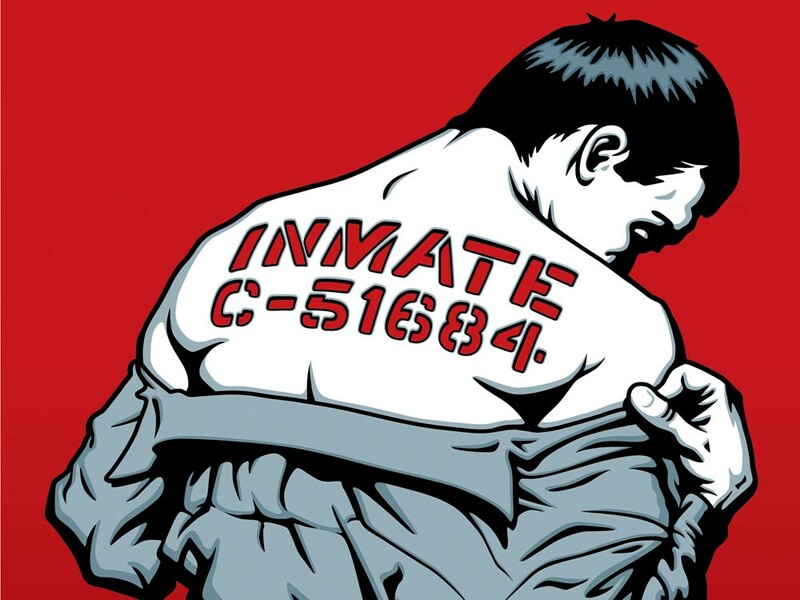 The corrections system should be reserved for truly dangerous people. “What’s happened is we have expanded the prison population well beyond what public safety would expect,” Mauer says. So how do we ensure that our prisons are filled with people who should be there? Anna Nordtvedt, an assistant Spokane County public defender, says the situation could be helped by decriminalizing driving without a license for people like Jerry Sumner who have unpaid fines. Nordtvedt suggests that people like Sumner and Collette who can’t pay their LFOs should be allowed to do community service. The ACLU report outlines several ways to address the issue, such as waiving non-mandatory fees for indigent felons, prohibiting auto-jail policies, banning the 12 percent interest on LFOs and ensuring that the voting rights of felons are restored upon release from custody — regardless of how much they owe in fines. Connecticut, Hawaii, Massachusetts and New Mexico have also passed “Ban the Box” laws — meaning employers can’t use job applications that require people to check a box if they have committed a felony. This prevents a felon — like Al-Hajri or Collette — from being immediately dismissed before they can tell their stories. Breean Beggs, the Spokane attorney, thinks felons should be assessed on a case by case basis. He says blanket laws banning all felons from doing some things is just dangerous. “[We’re] being broad and over-inclusive — that’s our current plan,” he says. “What I think people are realizing is that this is not working. It costs a lot of money and it’s counterproductive. Carol has been sober for 16 years. She got a good job, finally, after completing a degree program at Eastern Washington University and majoring in social work. She volunteers in her neighborhood and at the food bank. Seven years ago, she helped build a neighborhood C.O.P.S. shop — doing all of the wiring in the building herself. But when she turned in her application to be a volunteer, her felony came back to haunt her. And though Carol successfully had her record expunged a few years ago — which means she can legally say she is not a felon — she still feels a heavy guilt. Like she doesn’t deserve to have a good life because of a mistake she made 22 years ago. “Even though I’m not a felon anymore, I’ve lived with this identity for so long, I forget I’m not a felon anymore,” she says. Today, sitting in her office, she says she has “a full and happy life.” She’s worked hard to be able to say that. And now that she’s out of the system, she can see it for its flaws. “We were protecting people when people had leprosy by putting them on an island in Hawaii. And then we find out it’s not contagious. And neither is this sickness of keeping [felons] separate. It’s not contagious,” she says. “But it will continue to grow exponentially unless we can figure out a way to welcome people back in society. People won’t stay criminals when they are a part of society and feel like they are cared about. How "tough on crime" laws are failing our children. What happens when someone complains a cop used excessive force? Usually, not much.